I have thought a lot lately about the old charge that University faculty are all left-wingers who distort the minds of the tender children enrolled in their courses. I have never believed this. When I took my first job in Montana, my colleagues in the history department included a Missouri Synod Lutheran pastor who despised liberals and loved Rush Limbaugh, an Iraqi Seventh-Day Adventist who worried that African Americans would move to Billings because it was easier there to commit crimes, and an expert on lynching who saw nothing objectionable in the infamous Willie Horton ad run by the George HW Bush campaign against Michael Dukakis. I was surrounded by historians on the political right. More recently, a local radio show asked if my college would send a representative to discuss whether or not we were concerned about a lack of ideological diversity on campus, and just days before that, the recently installed Secretary of Education warned her audience at the Conservative Political Action Conference that “the faculty, from adjunct professors to deans, tell you want to do, what to say, and more ominously, what to think.” I wrote about that here, yesterday. I have little patience for charges such as these. One thing I like to do as a historian when confronted with questions like these is to ask those who believe that left-wingers have taken over the academy how the teaching of a given subject might change if I were farther to the right or the left than I am at present. Let’s talk about the history. Support your reasoning. Explain to me how the political affiliation of, say, a history professor, affects the way he or she teaches a given subject. 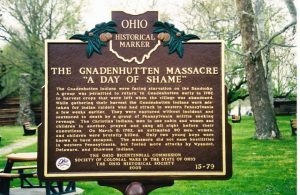 We can talk about slavery, or the American Revolution, or I might ask them about events like the massacre at Gnadenhutten, which occurred on this date in 1782. Because if we are to understand Native American history in all its complexity, I believe that we must confront the lacerating violence of events like Gnadenhutten. We must do so whether we are on the Right or the Left or in the middle. I would contend that an honest rendering of this event would not differ widely on the basis of who taught it. The fro ntier, we must remember, was a violent and at times a frightening place. No historian would dispute that, no matter what their politics, unless they chose to ignore the evidence completely. Many Anglo-American settlers living on war-ravaged frontiers simply could not trust their Indian neighbors. Settlers in the Ohio country, for example, experienced the horrors of warfare just as did Indians. Some of them witnessed the death of friends and neighbors in Indian attacks. More of them heard horrifying stories of Indian attack. These settlers had occasion to fear Indians. They acted, with violence and decision, to save themselves. But settlers found in their fears justification for horrible acts of terror. They could, as did Ohio country settlers in 1782, conclude that the singing of psalms by Christian Indians at the Moravian mission at Gnadenhutten was not the pious expression of praise to the One God but the ranting and boasts of savages who had wet their hands in the settlers’ blood. Native peoples had their own fears, of course. When Kentucky militiamen attacked a cluster of villages in northern Indiana where Potawatomis and many other native peoples lived, they threatened them with extermination. If native peoples refused to make peace, Brigadier General Charles Scott said, “your warriors will be slaughtered, your towns and villages ransacked and destroyed, your wives and children carried into captivity.” Read Jeffrey Ostler’s excellent piece in the William and Mary Quarterly from 2015. Indians feared genocidal violence from white Americans, and you cannot miss the expressions of that genocidal intent in the writings and statements of American officials. Words and deeds combined, a frightening mix. Many native peoples who lived in the Ohio country saw in the United States and its citizens, whatever its claims to desire peace, an existential threat to their existence. Gnadenhutten. The soldiers from Pennsylvania held a vote on whether or not to kill the 100 Christian Indians they had taken captive. This was, for native peoples, American democracy at work. As the Christians sang the last hymns they would sing, savage militiamen began to murder them, thirty men, three dozen women, and thirty-two children in all. Kids. Almost three dozen. I tell my students about these violent episodes. I mess around with the words. Murder becomes an expression of democracy. Frontier settlers become savages. I try to decenter things, upset expectations. I want the students to think about events like these, so formative in my own thinking about the meaning of Native American History. If you are a student, you will have to decide how to make sense of this stuff. We can talk about it or not. We can ignore it if we want to. 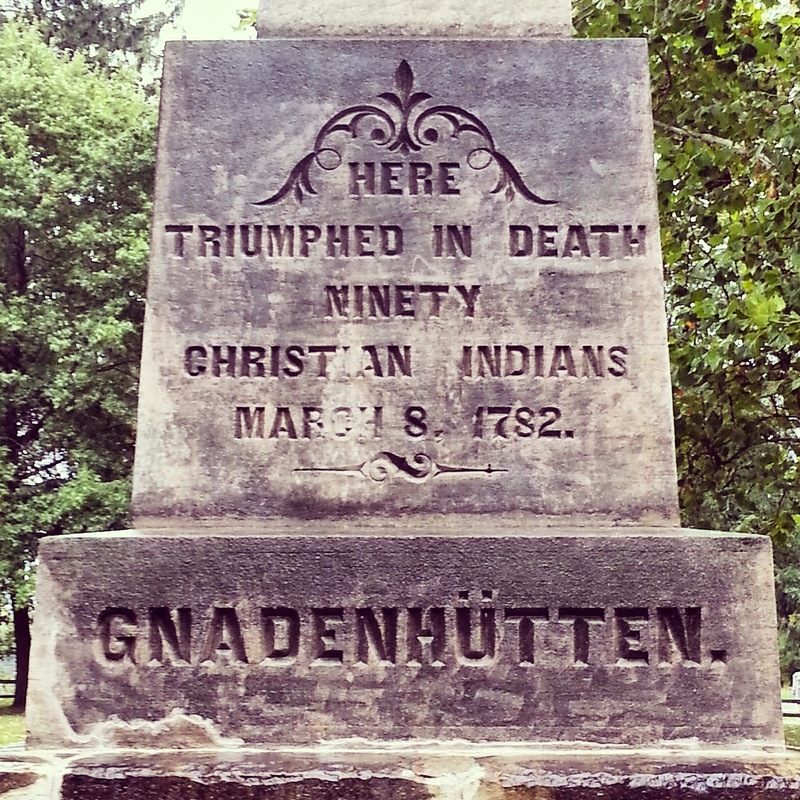 Maybe that dude in Texas, who I saw on a local television station when I lived down there defending that state’s crazy history curriculum, and who believed that a bad day in the United States was better than a good day anywhere else, would choose to dismiss Gnadenhutten as an exception. More likely he would not have us talk about it at all. 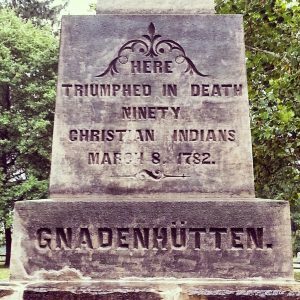 But Gnadenhutten cuts to the core of the American frontier experience, and we cannot confront that history without paying it heed. Left, Right, or Center.